The University of Minnesota’s main campus is divided into two campuses – one in St. Paul, the other in Minneapolis. The one in Minneapolis is divided in two again, straddling the east and west sides of the Mississippi River. On both sides are neighborhoods where musicians, artists and writers hang out. Both of these neighborhoods have their own music, their own character and their own legends – some of them have gone away and become more well known like Bob Dylan and Bonnie Raitt. Dinkytown on the east and the West Bank on the west are the names of these two places. 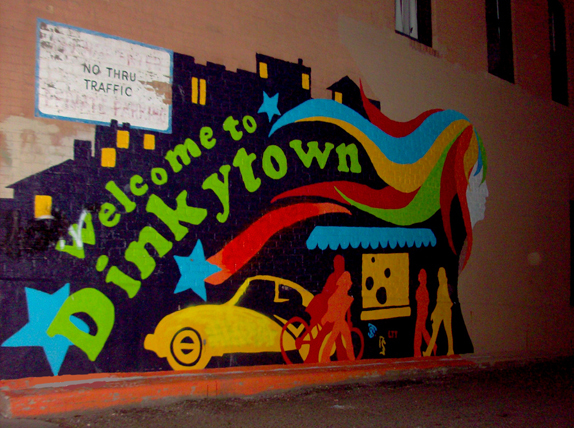 Dinkytown’s business district is two blocks long on 4th Street, between 13th and 15th Avenue. It got its unusual name because of the trolleys that ran between the two U campuses – called Dinky’s – used to be housed nearby. The center of Dinkytown is the corner of 14th Avenue and 4th Street, where the Loring Pasta Bar sits. For the last 10 years it’s sat in the place where Gray’s drugstore used to be. Bob Dylan and his then-girlfriend Ellen Baker would sip sodas there while he had a room upstairs with a rent of $30/month. When Bob Dylan came to Dinkytown in the fall of 1959, he was still Bobby Zimmerman. He had played a few gigs with Bobby Vee in North Dakota under the name Elston Gunn that summer and he arrived in Minneapolis to go to the U of M. He stayed in the Sigma Alpha Mu fraternity while taking a few classes in the U’s liberal arts program. He started playing at the 10 O’Clock Scholar, which used to be on the corner of 5th Street and 15th Avenue. He would play for a few hours in exchange for a meal or a percentage of the sales. While at the Scholar, Bob played with Spider John Koerner – the first guy he met there – and Tony Glover, both of whom he talks about in his book Chronicles. When he asked for a raise, he was kicked out and started playing at the Bastille and the Purple Onion Pizza Parlor in St. Paul. There’s a Purple Onion on University just next to Dinkytown, but the name is apparently a coincidence. Bob only played covers then, most of them traditional or Woody Guthrie, Jimmy Rogers or Johnny Cash songs. He spent the summer of 1960 in Denver, where he met a young Judy Collins. When he came back he had his harmonica. His friend Dave Whitaker gave Bob a copy of No Direction Home, Woody Guthrie’s autobiography. Bob devoured it and adopted the name Bob Dylan, after the poet Dylan Thomas. He changed his dream of being a rock star to being a traveling troubadour. He left Minneapolis in December 1960 for Chicago, landing in New York on January 24, 1961. And the rest is history. John Koerner came to the U of M as an engineering student in the late ‘50s. He was given a guitar and some blues records and became “Spider John”. He was a regular at the Scholar, playing with Bob and Dave Ray. Koerner, Ray and another bluesman Tony Glover started playing together at the Triangle Bar on the West Bank. They would play off an on until Ray’s death in 2002. Koerner went to New York in 1966, but was sent back to form a band by Electra Records. With pianist Willie Murphy he recorded the album Running, Jumping, Standing Still. Ray was the producer and engineer on Bonnie Raitt’s self-titled debut album, where she played Koerner’s song ‘I Ain’t Blue’. Willie Murphy also produced the album and played on it along with members of his band The Bees. Raitt’s brother Steve along with Ray ran a studio Sweet Jane Ltd. in Cushing, Minnesota where The Bees debut album was recorded. Murphy had a show on KFAI when the station began in the Walker Community Church in south Minneapolis in 1978. The following year Murphy helped get a show for Lazy Bill Lucas. Lazy Bill Lucas got his name from Little Walter Jacobs. On his radio show he’d bring in blues musicians when they stopped in town. Joel Johnson took over the show after Lucas died in 1982 and continued it until his own death in 2003. Harold Tremblay’s show House Party continues the spirit of Lucas and Johnson’s shows on KFAI. He plays a Lazy Bill Lucas track on every show. Garrison Keillor moved to the West Bank in 1964. He was a student at the U and the editor of its literary magazine Ivory Tower. He’d hung out at the Scholar, which he describes in Homegrown Democrat and wrote about his stay in the West Bank in the introduction to Cyn Collins’ book West Bank Boogie. In 1969, he found a job as a morning show radio host on KSJR in Collegeville, Minnesota, not far from St. Cloud. He played a wide selection of music and eventually had his own house band, The Powdermilk Buscuit Band, made up of friends of his, naming the show A Prairie Home Companion. The players were local musicians like Bill Hinkley on the fiddle, Judy Larson who sang. When Bill Hinkley left, Mary Dushane replaced him on fiddle. Butch Thompson was the house pianist on the show until 1986, though he still frequently performs there. The show moved to St. Paul in 1974 and it’s been there ever since. Hinkley and Larson also played in an Australian bush band with Maury Bernstein. Bernstein played folk songs at the Scholar and helped bring musicians there. He taught ethnomusicology at the U for a few years. Pop Wagner organized the June Apple Musician’s Co-op with Bob Bovee. Mary Dushane and Jerry Rau were members of the collective. It had been inspired by Utah Philips’ Wildflowers Co-op in Saratoga Springs. He also started a label, Train on the Island, for musicians to put out their records. Dakota Dave Hull and Sean Blackburn’s album Here’s Sean Again was the first they put out. Hull currently has a show on KFAI. Dakota Dave Hull has a show on KFAI every Thursday morning, where he plays folk and roots music with either local musicians like Andy Cohen or Tim Eriksen or the ones who pass through town. Jerry Rau continues to play his own songs around the University campus and downtown Minneapolis. The West Bank is a mix of the older folks – the people who made it the Haight-Ashbury of the Midwest a generation earlier, and immigrants from Somalia. Dinkytown still swarms with students and independent shops, though a few brand stores like McDonalds and Potbelly Sandwiches have gotten in. The Scholar closed down and went through a bunch of changes before becoming a video rental store for a while. When that closed, the building was torn down. The Loring Pasta Bar and the Varsity Theater are the places to find local music in Dinkytown, while Nomad’s bar, the Cedar Cultural Center and Palmers bar are the places to find the legends, new folks and those passing through town. The Acadia Cafe on the corner of Cedar and Riverside has a growing stable of younger artists who work for a meal or a small amount of change, just like Bob. The folks you’ll find at these shows are the kinds of people Garrison Keillor saw living in the West Bank when he moved there almost half a century ago: “They had jumped off the career bus and were living for what they loved – the true American Dream, to buck the trend and go your own way, guided by your heart”.